Usain Bolt completed his triple triple by anchoring the Jamaican men’s 4x100m to victory for the third time in as many Olympics.The time, 37.27, may not have been quite as impressive as in the past; the first two relay wins were both world records. Bolt got the baton from Nickel Ashmeade nearly even with Japan and the USA, but within strides he was already clear of both teams. As usual, he crossed the line with daylight between himself and the competition. 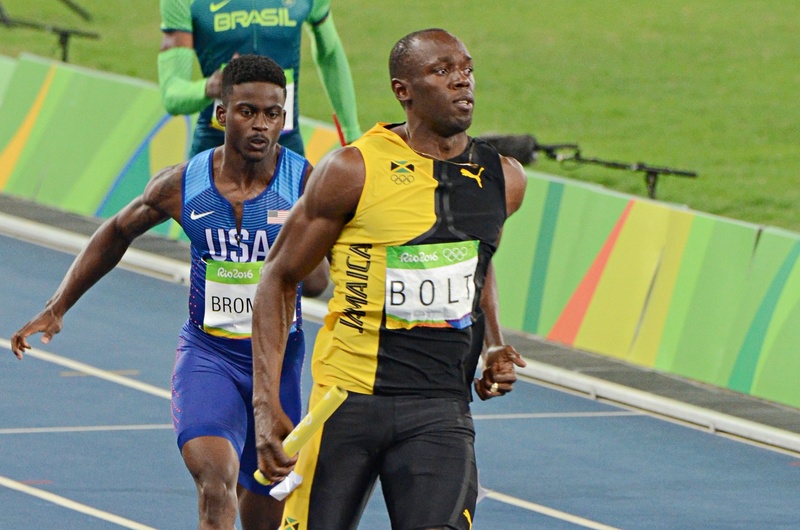 It is Bolt’s ninth Olympic gold medal (and his last, he says). In Bolt’s wake, Japan’s anchor Aska Cambridge pulled away from Trayvon Bromell to bring them across the line in 37.60, an Asian record. The old record already belonged to them from the second heat of the qualifying round; before that, the Chinese had lowered it in the first heat. It was Japan’s second ever Olympic medal in this event, adding to the bronze they won in 2008. Bromell, coping with an achilles problem, leaned to stay ahead of the hard-charging Andre de Grasse anchoring the Canadian team. Bromell then tumbled, and though he bounced back up, he left the track in a wheelchair. The Jamaicans, Japanese and US teams set out on victory laps, pausing to wait for the women’s 5000m medal ceremony, the US team without Bromell, but when the trio resumed walking they saw their team listed as a DQ in the results on the stadium scoreboard. The rule cited was 170.7, which deals with the baton exchange; apparently when lead-off runner Mike Rodgers passed to second leg Justin Gatlin, the baton touched Gatlin’s hand before it reached the exchange zone. This disqualification elevated Canada to bronze position, the medal they had apparently won in 2012 before being disqualified for a lane violation. Their time of 37.64 was a national record, and the medal their first in this event for 20 years. For the USA it was the latest entry in a roll of disappointment stretching back as long as Bolt has been winning. This would be their third consecutive Olympic DQ or DNF.